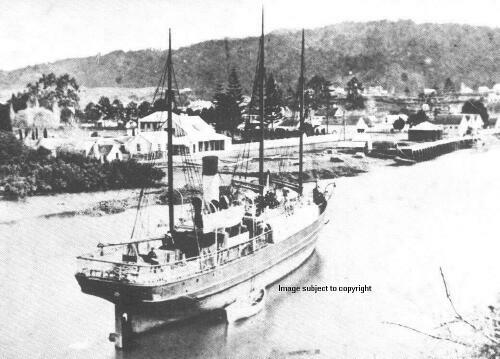 MacGREGOR aground in the Town Basin at Whangarei in 1884. 1881 Built for A. McGregor, Auckland. Named MacGREGOR to distinguish her from the Frisco Mail Steamer McGREGOR. 1885 May 4 collided with WELLINGTON in the Hauraki Gulf. 1887 August 11 stranded briefly at Wanganui and safely refloated. 1888 sold to S.A. Joseph, Sydney. N.S.W. Re-registered at Sydney. 1895 sold to Burns Philp & Co. Ltd.